Don't waste your money. This isn't the fleece that you are looking for. 3/28/14: I just got this jacket today in the mail. I've gotta say I was expecting more of a fleece than an incredibly thin stretching zip-up sweatshirt. I got it for its light weight for backpacking and as an insulating layer under my rain shell in cold/rainy/snowy/windy weather, and my first impression of the jacket has left me a little concerned about my choice. My previous fleece/all weather insulating layer was a Columbia Steens fleece that I got at a thrift store with the tags still on it for $12. 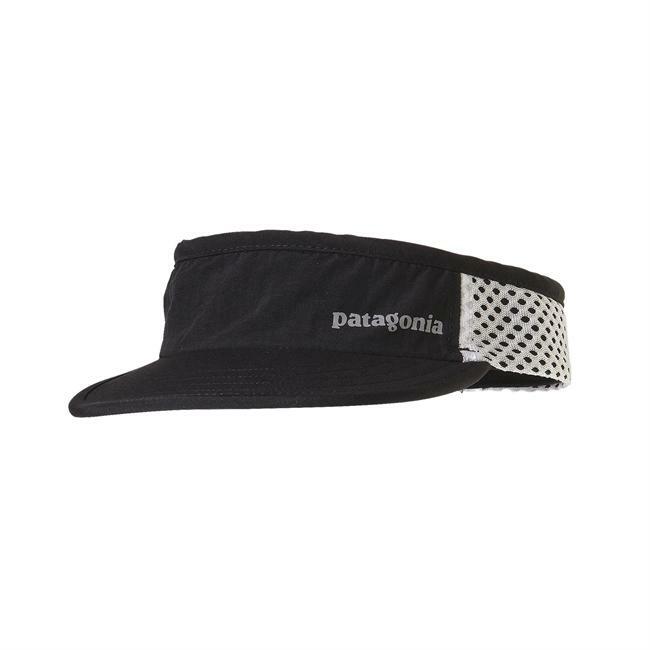 I did a review of it on here, and i think the $12 Clumbia is much more water resistant, wind resistant and warmer. The Desna is longer, has a hood, packs down smaller more easily, weighs less, is more breathable under the arms, and is more comfortable due to the very thin and stretchy material, but value vs value, the Columbia wins hands down in my opinion. 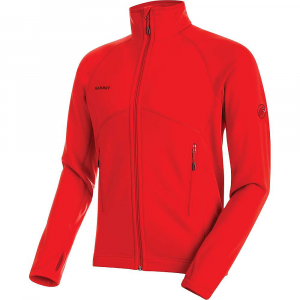 The Desna is very overpriced for what it is, and all of the reviews I've read online give it way more credit than this jacket is worth. Despite my initial first impressions of this "fleece", I put it on over a moisture wicking t-shirt, grabbed my pack, and took to the game lands down the road. It's the end of March in northeastern PA and it's been a windy 45 degree day with sun/clouds mix and there's spots in the forest that still have 6" of snow in some places. There was a little rain earlier in the day also so the environment was relatively cold and damp with ice in the ravines and water dripping from trees. As the wind blew, I could feel it a whole lot through the jacket, which made me immediately think that the people online that said this thing was wind resistant were full of crap. Then as I went climbing up the steep ice coated ravines, I got some drips of water on me from the rocks up above, and it immediately went through and got my arms wet. This made me think that the people who reviewed this jacket online had lied to me twice now. 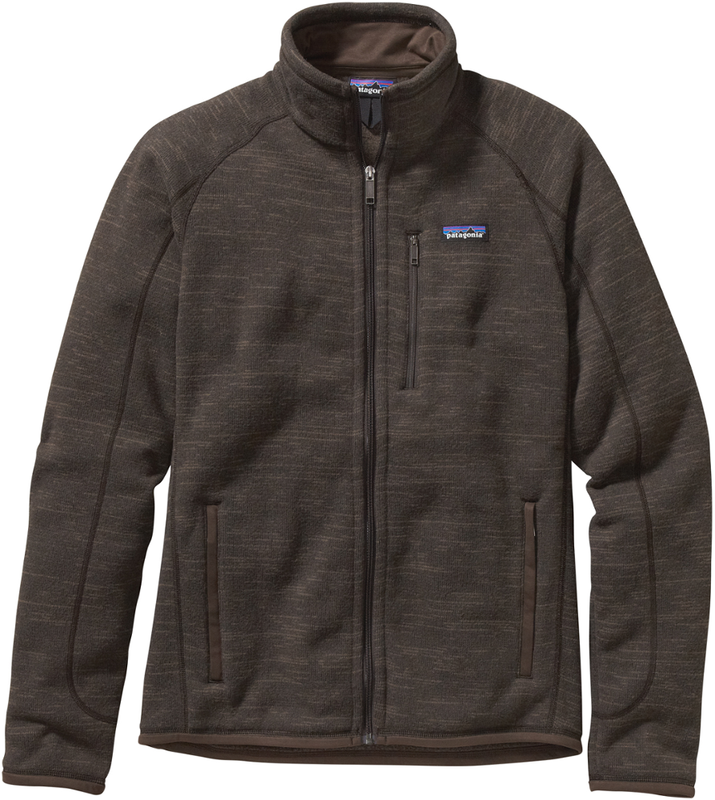 I've worn a $12 Columbia Steens fleece in the exact same scenarios several dozen times throughout the thick of winter, and while working outside in a steady drizzle, and the Columbia blows the Mt Hardwear out of the water. But back to the Desna. As I climbed up the ice and rocks, I stayed warm despite the constant drafts, and I never started to sweat even during extended periods of exerted energy. I also had a backpack on my back weighing roughly 13 lbs. In addition to the jacket not really being at all as advertised (not really wind resistant or water resistant), the hood does not fit like a balaclava at all. It zips up so that it's snug to the bottom of your chin, but there's no possible way it could cover a mouth, let alone the nose too. The hood is a little loose for a hood that's suppose to be "snug" as advertised. All in all, after having this jacket for 5 hours, and testing it once in what I would call average fleece weather, I would not recommend this to a friend. It's my first Mountain Hardwear product and I have to say that I am very unimpressed. It's severely overpriced, and falsely advertised. Find it in a store before you buy it online (a good basic rule, but not always an option). EDIT 6/17/2014: I keep trying to like this jacket more than I originally did, but it's just too thin to be of use in cooler weather. 45 degrees is about the temp. limit of this "fleece", and that's pushing it. There is almost no air resistance at all. I think I would classify this jacket as a ladies house coat, or a sweatshirt for semi cool summer nights. If you're looking for an insulating layer fleece to keep you warm, look elsewhere. 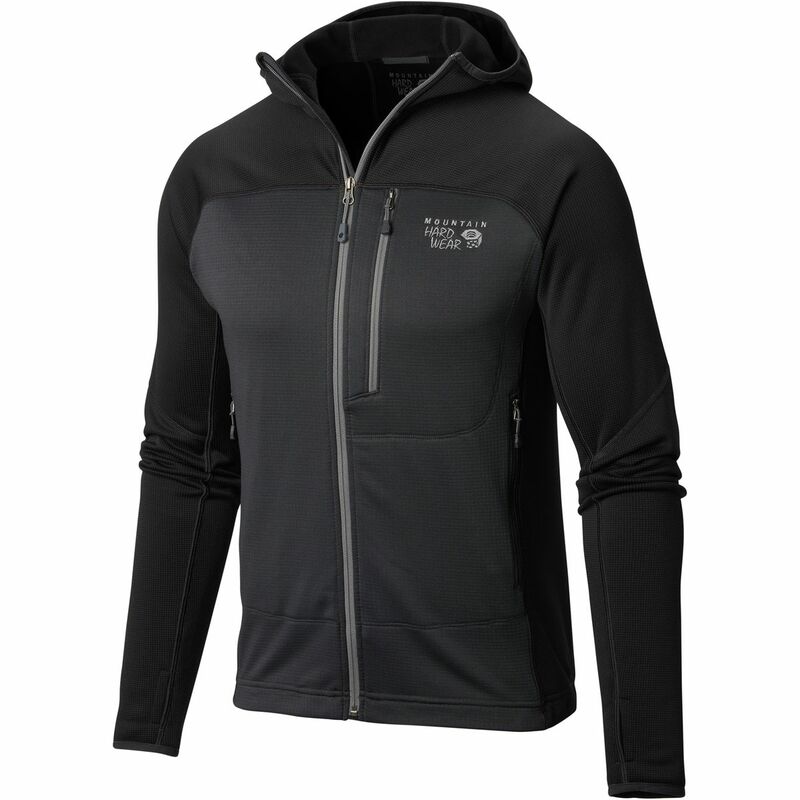 Excellent light fleece for midlayer insulation when it's cold and windy or outer layer when it's not windy. Works well for what it's designed for. Thumbholes are great when needed. I've had this fleece for going on three years now and use it on a regular basis for everything from peak bagging to xc skiing to mountain biking to dog walking. All in Alaska, at temps from +50°F (outer layer for anything other than rain) to -45°F (mid layer while xc skiing). —"Incredibly thin", "Not really a fleece", "Not for cool weather", "You can see through it when held up". There are different 'weights' of fleece for different purposes. This is a lightweight fleece. Equivalent to about 100 weight, though warmth-wise I find it to be in between 100 and 200 weight. It's not a windproof fleece. It's designed to lean more toward breathability than wind resistance. If it's windy, this jacket should have a shell of some sort worn over it. This allows the user to be able to dress appropriately for a wider range of temperatures and conditions than one do it all jacket would. Very light rain beads up and rolls off on mine (except in the higher wear areas) for about 20 minutes, which is usually long enough for me to figure out that I need to put on my rain jacket. —"The hood does not fit at all as advertised (very loose, acts as wind sock)"
Hood fits me fine with the zipper all the way up, as designed, and is loose enough to not be restrictive. I might just have a large noggin though. I use the thumbholes all the time. I have big hands, I swing a sledgehammer for a living. They're designed to be used on bare hands or over a liner glove only, not over thicker gloves. —"Expensive for what it is"
I would agree if we had the same experience, but it appears we've had the complete opposite experiences. Its drying time has been on par with other insulation layers for me. 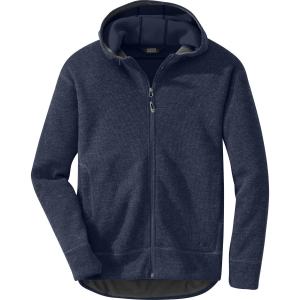 "A technical fleece with incredible stretch from hood to hem. Designed for maximum activity with unmatched freedom of movement, the Desna Jacket’s athletic fit and close-fitting hood allow it to fit easily under shells or parkas as a lightweight midlayer." This is not designed to be an outer layer unless temps and conditions are mild. It's designed for high output activity accompanied by an appropriate shell if needed. Welcome to Trailspace, Sean. Thanks for sharing your experience with this jacket. 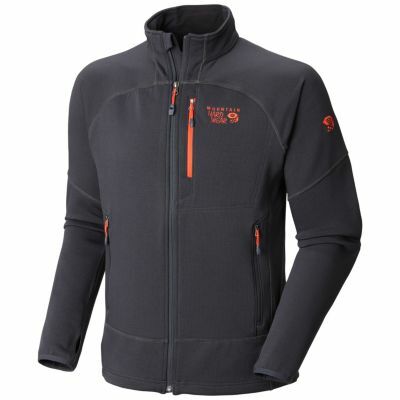 The Mountain Hardwear Desna Jacket is not available from the stores we monitor. It was last seen April 14, 2019	at REI.